First, things first. I did not do a very good job of highlighting Sara's great blog. 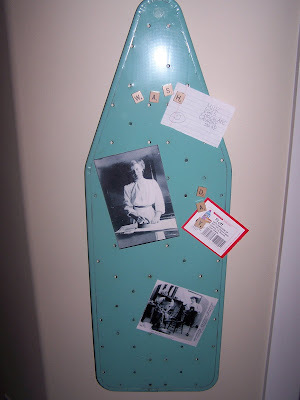 I didn't know how to get pictures from her blog to mine, but please, if you haven't, go visit her. You will be glad you did. The table and chairs have been delivered, I have been paid, the stress has eased! I think she really liked it. Here is a sort of picture--all the others were fuzzy. 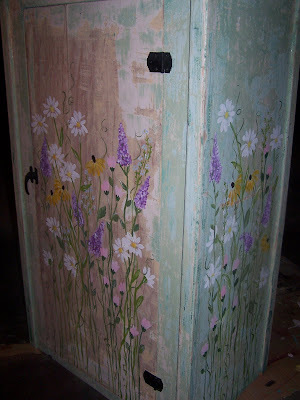 This is another special order I have been working on, a great cabinet that the customer wanted flowers painted on. It has been a nice change of pace from the black. 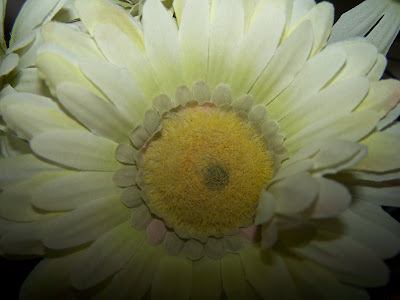 a fake daisy (the only fake plant I have). Your blogs are also a major source of inspiration. Before I head out to my garage most days, I check out some of your blogs for some brain stimulation. Sara's Art House is one of my favorites. Her paintings and colors make me smile. I don't copy, I don't think, " I am going to paint something just like she did," I just look and appreciate the creativity. It jump starts my creativity. So, if you are not already a fan of Sara's, check her out today. And thanks for the inspiration! 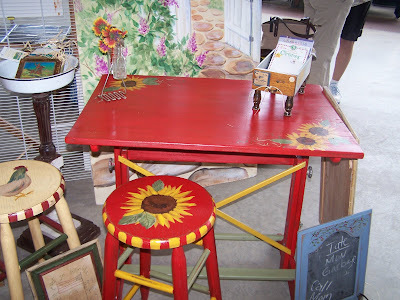 I had a few things that I haven't sold at my antique booth that I decided to add a little embellishment to. I will take these to Farmer's Market tomorrow. Swirls, yes, more swirls, but a little leafy twig in there too for a change. 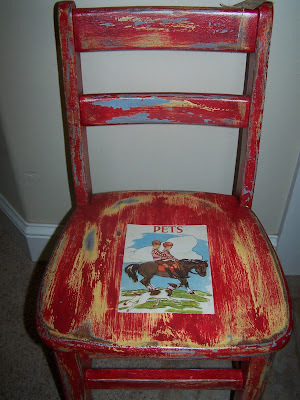 I added a great picture from an old reader to this child's chair. I lightly sanded it, and used 2 coats of walnut gel stain. 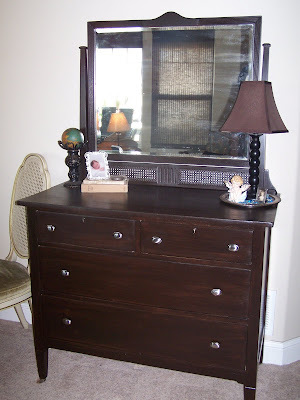 I loved it too much to part with it, so it is in my entry area now. I need artwork to go beside it. 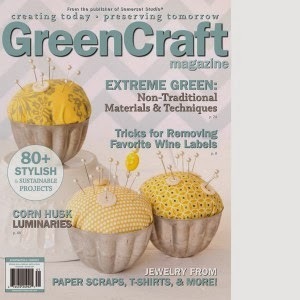 I think I will make something. I am off to back to school spirit night for the high school. Get to watch eldest child scrimmage in football and go to a BBQ. Always a fun, community event. I have had a frustrating day. First, I thought hubby was going to be home today, but informed me last night that he had a school in-service all day. I was hoping for his help with the children who need some space from each other (7 more days until school starts!). Grounded 1 of them today--too much fighting! 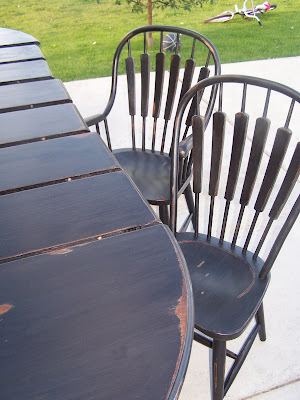 I am working on a special order that is taking me much longer than I had hoped--6 chairs and a dining room table with 6, yes 6, leaves. 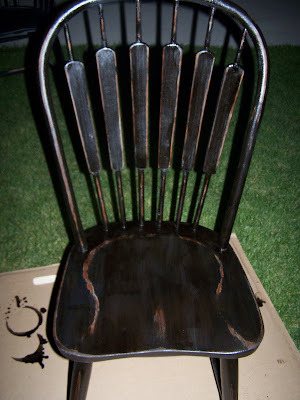 I am painting it black and distressing it. Which distresses me. I've done it plenty, but it just seems to be having issues. First, I used tinted primer, which I never do. 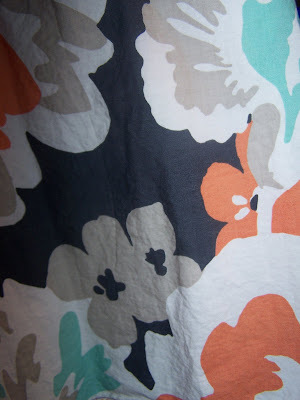 The darkest they could tint it was a blue gray, which when I sanded, you could see and the stain wouldn't cover. So after a trip to get darker stain, and doing some touch up to cover some of the gray , some praying, it turned out like I wanted. My sandpaper is gumming up much more than usual, I don't know why, but I bought more so I can change it frequently. I am getting up at 6:30 AM to work on it--I want it done. I quoted a fairly high price for doing this because I knew the chairs alone would take time. 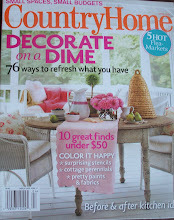 I told my husband before I even did the job, that I was earmarking the money for a new chair for the living room. I keep saying to myself, "This is worth a new chair." We went for a 5 or so mile hike this evening, which completely helped to clear my head and attitude. I hope to show you more fun things in a day or two--this painting is just plain boring! But, it is worth a new chair, really it is. Thank you so much for all of the truly wonderful comments on my SITS day. I felt very loved. The highest compliment that I can be paid is to hear that I inspired many of you to try a project. That means so much to me, as that is my hope, to inspire others to see something in a different way, to see new life in something old. I am also excited that so many of you signed up to follow my blog. To answer a few questions. 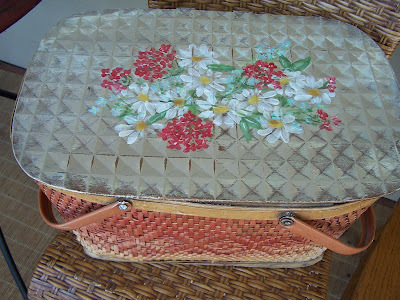 Yes, I do sell my things, at the Farmer's Market in the summer and at a local antique place. I have a few other irons in the fire as well and am thinking of doing an etsy shop. 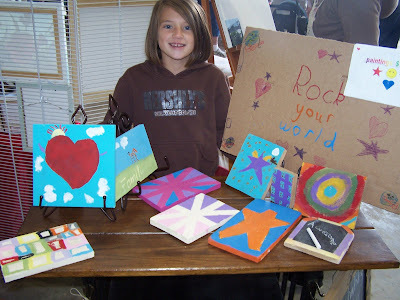 Here is a picture of my daughter, selling some of her paintings this past week with me. 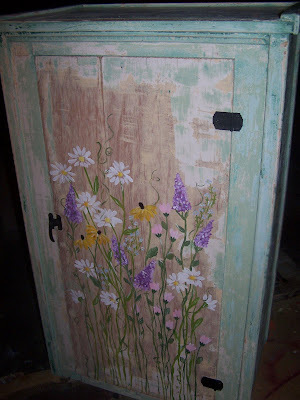 I do build things out of junk as well as painting on them. 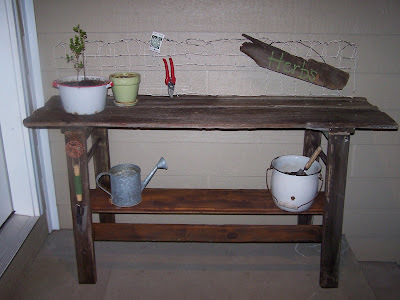 I built the potting table I showed, and lots of other things that you can find in past posts. I actually really love the building part. 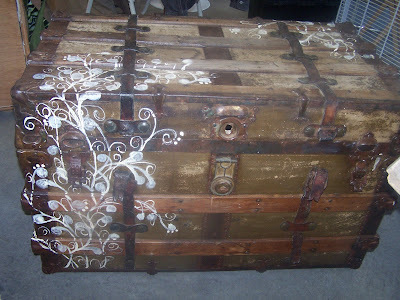 I paint my pieces free-hand and I am self-taught. Trial and error is a big part of it. 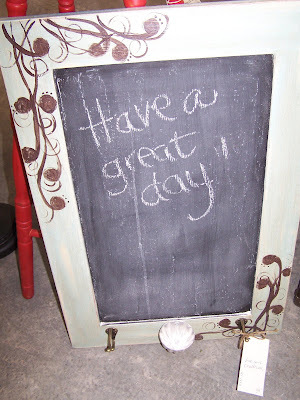 Here are a few chalkboards I did for last week's market. 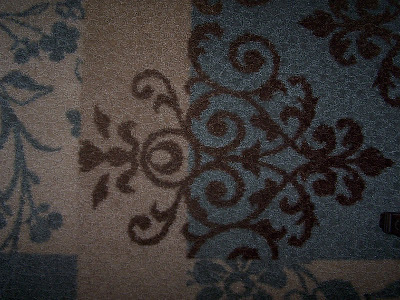 The one is an oceany blue color, hard to tell with the flash. It was so cold at the market, 45 degrees, but I did well, as did my daughter Ü.
PS--Someone wanted to link to my blog, that is great. I can't get your blog information from your post and it saidd you didn't share your blogger information. It's my day, my SITS day. Yeah for me! SITS is awesome--thanks Heather and Tiffany for all you do! I have found so many wonderful blogs through SITS, and I hope some of the visitors today, will become a follower and be back in the future. 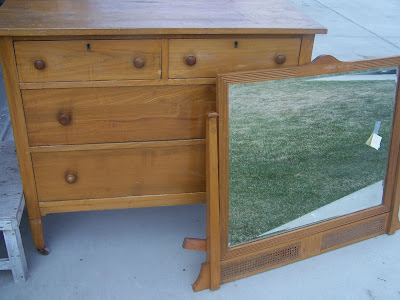 My blog is a little about my family, and a little about my faith, but mostly about JUNK! 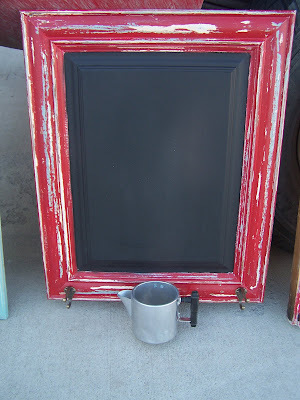 Made from an old chicken coop door and playset ladder. 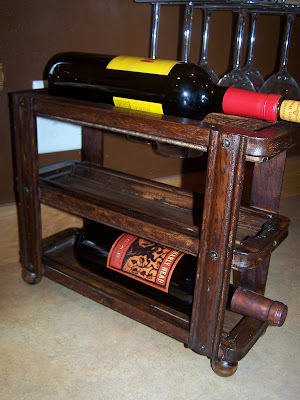 Wine rack made from sewing machine drawer. 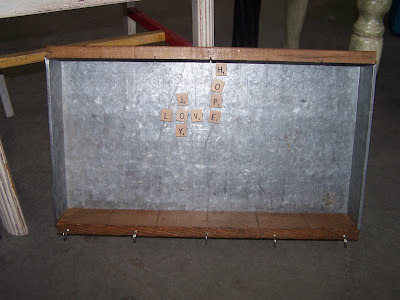 Ladder made into a message center. Thanks for stopping by and have a junky day! 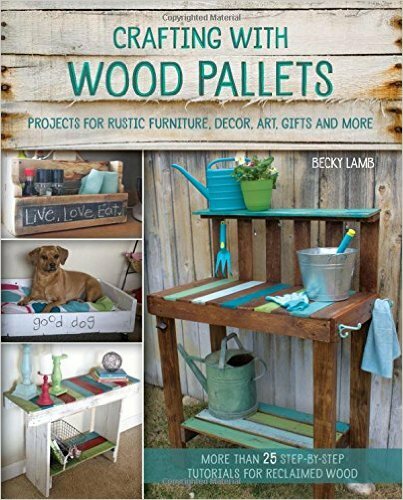 I have found a half dozen of these little wooden shelves at garage sales over the past few years. 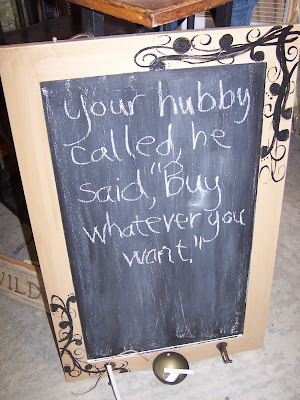 They are cheap, I think put out by Tender Heart Treasures. 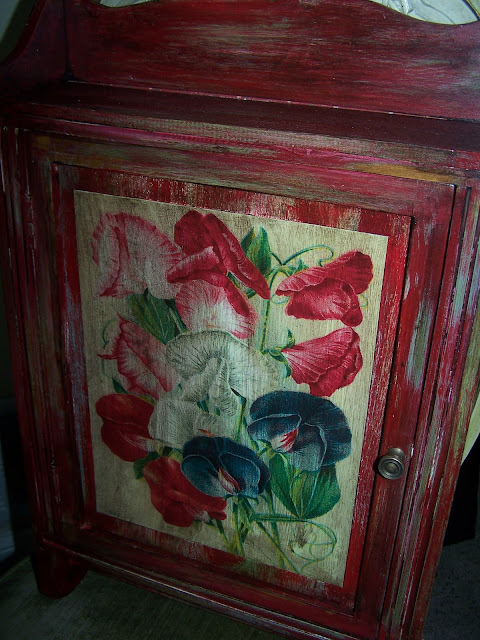 I painted this with layers of paint and then decoupaged this sweet pea picture on. 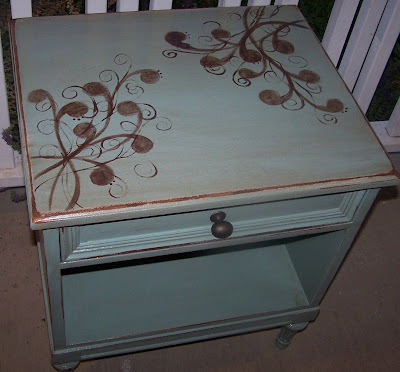 Dark stain over the top is definitely the finishing touch to make a sweet little cabinet. 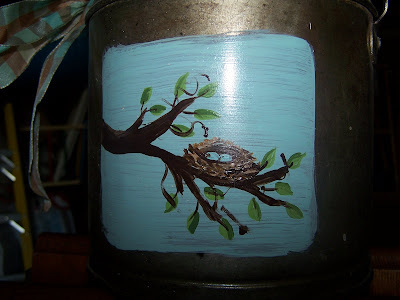 For anyone who has been reading my blog for awhile, you know I love to paint a nest. 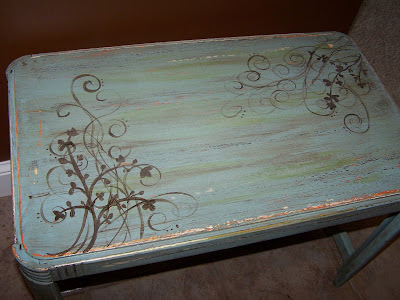 They are so full of hope and promise and I love the blue and brown combo too! We have a big Sweet Pea festival here this weekend. 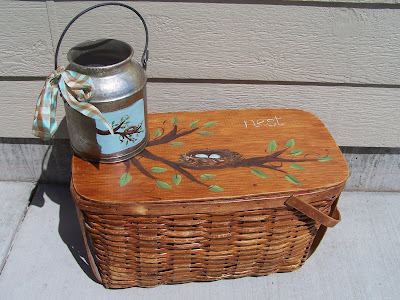 I decided to paint some on this lunchbox. 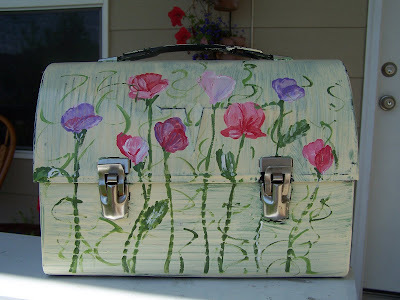 Not my best painting job--sweet peas are hard, but it is what it is. 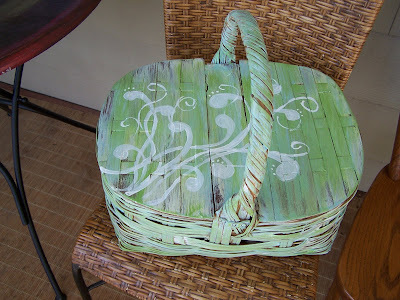 I have had these picnic baskets in my booth and they haven't sold, so I decided to paint them and take them to Farmer's Market. 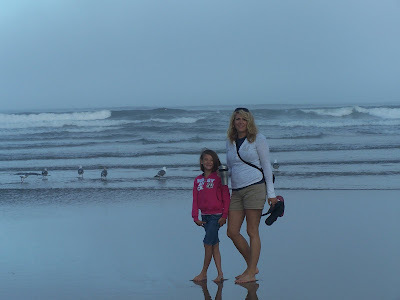 Last week, we had a wonderful trip to the Oregon Coast (I had posts ready to go for you all). We did spend a couple days in Portland in their record breaking heat! Here we are doing a little early morning shell hunting. Thanks for all of your sweet comments and happy anniversary wishes. Blogging buddies are the best! 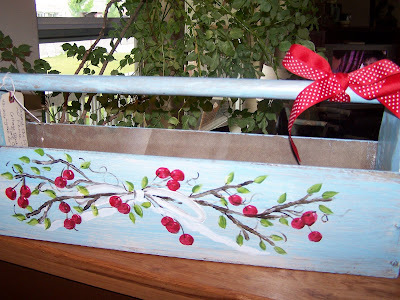 A little, old tool box, painted blue with cherries.